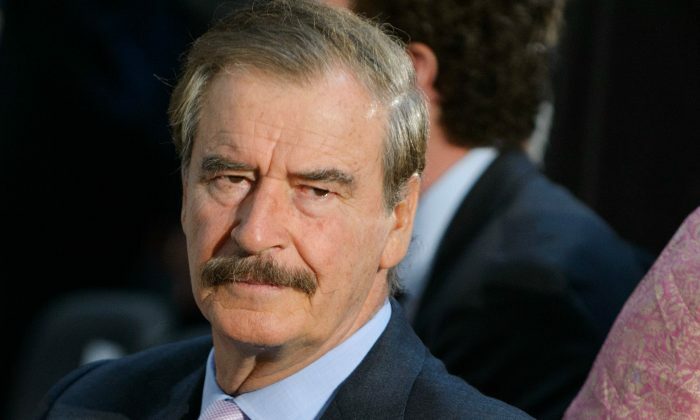 Former Mexican president Vicente Fox apologized on May 4 for offending Donald Trump, however he says he has not changed his view of the presidential hopeful. But he emphasized that he wasn’t the only one offended. Fox also invited Trump to visit Mexico—comments that were widely criticized by people who said he had given in to Trump. But Fox defended his remarks, saying he is still against the real estate mogul, and only invited him to Mexico so Trump could be educated. “If I invite him to Mexico it’s to open his eyes, so he can wake up and see what the reality is in Mexico. To actually know and no to speak only to win electoral votes with people who listen because of fear,” said the former president in an interview with Radioformula. Fox said the worst thing that can happen is for Trump to be president. “This character is a real threat for the United States itself, for the world, and for our people here, he’s proposing a series of completely crazy ideas,” said Fox to Radioformula. Meanwhile, Fox praised former secretary of state Hillary Clinton and said she is a great candidate. Mantengo mi posición en contra de las politicas de @realDonaldTrump, sigamos empujando para evitar que esta pesadilla se vuelva realidad. Fox made fun of Trump in a video with TMZ, saying no authentic Mexican dish can come from Trump Tower. A Gallup poll from March 11, shows Trump has a 77 percent unfavorable rating with U.S. Hispanics.